Department of Pharmacognosy 1, K. L. E’s College of Pharmacy, Hubli - 580031, Karnataka, India. Moulana Azad Institute of Pharmacy 2, Jodhpur - 342008, Rajasthan, India. ABSTRACT: Asthma is a disease of the human respiratory system. The different extract of bark was obtained by successive extraction with petroleum ether, butanol, ethyl acetate and alcohol by Soxhlet. These extracts were evaluated for antiasthmatic activity by using in-vitro model, i.e., spasmolytic activity in isolated guinea pig lung strip using histamine for induction of bronchoconstriction in guinea pigs. The effect of S. extracts of the bark of the plant on isolated guinea pig lung strip was studied to know the mechanism by which the extracts exhibited muscle relaxant activity. The study showed the few extracts are effective against histamine-induced contraction. The result revealed that the antiasthmatic activity of extracts might be due to the presence of saponins and flavonoids. INTRODUCTION: Bronchial asthma is an inflammatory disorder characterized by various airway obstruction, airway inflammation and bronchial hyperresponsiveness 1 and it is a global health problem that results from a complex integration between genetic and environmental factors 2. During attacks (exacerbations), the smooth muscle cells in the bronchi constrict, and the airway becomes inflamed and swollen with difficulty in breathing 3. In India the chance of becoming asthmatic rises tremendously due to increasing in population, pollution, sudden change in climate, unhygienic lifestyle. Through a variety of treatment are available to manage asthma, but none of them prove to be satisfactory. Despite the availability of a wide range of drugs, the relief offered by them is mainly symptomatic and short-lived 4. Moreover, these drugs produce side effects. Therefore, there is a dire need to identify effective and safe remedies to treat bronchial asthma. The current accepted modern medicine or allopathy has gradually developed over the years by scientific and observational efforts of scientists. As a result, there is a high prevalence of use of complementary and alternative medicines for the treatment of the disease. Ficus racemosa Linn. belongs to the family Moraceae which is a subdivision of Urticaceae. The family consists of more than 116 genera and about 1632 species chiefly found in the tropics. It is an evergreen tree with 50-60 ft. height, a large deciduous tree distributed all over India, and ceylon found throughout the year, grows in the evergreen forest. This species grows in moist tropical and subtropical climate is preferring warm and moist sites with annual rainfall from 500 mm to 2000 mm 5-10. The active constituents are obtained from the Root and sap of root, bark, leaves, fruits, latex. Many tribal peoples and Ayurvedic practitioners also prescribed in their formulation for the treatment of asthma and piles 11-14. The plant Ficus racemosa Linn. (Moraceae) has been traditionally claimed to be useful in asthmatic condition, as an antitussive, anti-inflammatory 11-12. Though there are some scientific reports on this plant, the plant has not been explored for its anti-asthmatic property. Hence, in the present study, Ficus racemosa bark has been investigated for its possible anti-asthmatic activity. In the present study, we have different extracts of the bark of Ficus racemosa L. (Moraceae). The extracts were obtained by successive extraction with solvents in increasing order of polarity like petroleum ether (40-60 ºC), butanol, ethyl acetate, and alcohol by soxhlet method, and investigated on guinea pig by using in-vitro models. Plant Material: The stem bark of Ficus racemosa Linn. was collected from the Botanical Garden, Karnatak University, Dharwad (Karnataka State) and authenticated by Dr. G.R Hegde, Professor, and Head, P.G. Departement of Botany, Karnatak University, Dharwad. A voucher specimen no. ‘04PG0356’ has been deposited in the PG Pharmacognosy laboratory of the college for future reference. Preparation of Extract: Authenticated stem bark of Ficus racemosa was shade dried at room temperature, pulverized, and 100g of the powder was extracted exhaustively and successively with various solvents in increasing order of polarity viz., petroleum ether (40-60 ºC), butanol, ethyl acetate, alcohol. The extracts were concentrated to dryness under reduced pressure and obtained extracts were stored in a refrigerator at 4 ºC until use. Chemicals: Histamine, Mepyramine, DMSO and Tyrode Solution. Spasmolytic Activity in Isolated Guinea Pig Lung Strip: An overnight fasted guinea pig was sacrificed, and the lungs strip was mounted in an organ bath containing tyrode solution. The tyrode solution was continuously aerated and maintained at 37 ºC. The tissue was allowed to equilibrate for 30 min under a load of 500 mg. All the working solution and doses are made by dissolving in tyrode solution (except pet ether extract, it was dissolved in DMSO). Doses of histamine (25 μg/ml) were introduced for a contact time of 30 sec and the response evoked by each histamine was recorded by 5 min time cycle 15-16. After obtaining a dose-response curve of histamine on the lung strip, the dose which gave the median response was selected and was repeated with graded doses of extracts of the Ficus racemosa Linn. in different concentrations i.e. (1 mg/ml, 10 mg/ml, 100 mg/ml, in 0.1, 0.2, 0.4, 0.8, 1.6, 3.2 ml dose) to determine whether the extract could inhibit the highest response of histamine or not. This was done until the dose which gave complete or maximum inhibition of histamine response, i.e. relaxation of the contraction induced by the histamine. Observation is shown below in Table 1 and Fig. 1-5. Fig. 1: A positive control experiment was conducted using 1 mg/ml mepyramine to obtain a dose (from 1 mg/ml to 100 mg /ml) response curve of successive petroleum ether (40-60 ºC) extract. X-axis for the dose of drug administered (ml) and Y-axis for the height of contraction (cm). Fig. 2: A positive control experiment was conducted using 1 mg/ml mepyramine to obtain a dose (from 1 mg/ml to 100 mg /ml) response curve of successive butanolic extract. X-axis for a dose of drug administered (ml) and Y-axis for the height of contraction (cm). Fig. 3: A positive control experiment was conducted using 1 mg/ml mepyramine to obtain a dose (from 1 mg/ml to 100 mg /ml) response curve of successive ethyl acetate extract. X axis has a dose of drug administered (ml) and Y-axis for the height of contraction (cm). Fig. 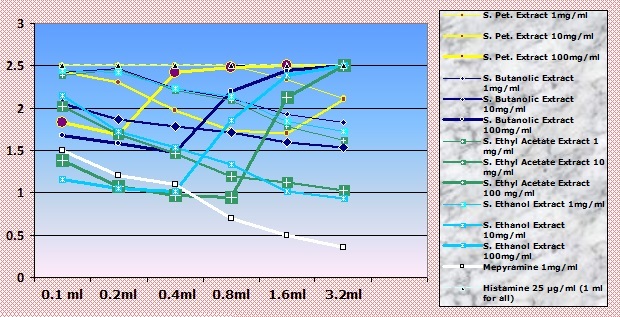 4: A positive control experiment was conducted using 1 mg/ml mepyramine to obtain a dose (from 1 mg/ml to 100 mg /ml) response curve of successive alcoholic extract. X axis has a dose of drug administered (ml) and Y-axis for the height of contraction (cm). Fig. 5: A positive control experiment was conducted using 1 mg/ml mepyramine and obtain a comparative dose (from 1 mg/ml to 100 mg /ml) response curve of successive petroleum ether (40-60 ºC), S. Butanolic, S. Ethyl acetate, and S. alcoholic extracts. X-axis has a dose of drug administered (ml) and Y-axis for the height of contraction (cm). 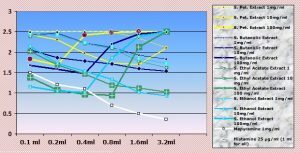 RESULTS AND DISCUSSION: All the extracts were not shown any relaxation or very slight relaxation against histamine contraction at low dose concentration so when we increase the concentration of dose of extracts, we were got significant as well as reproducible result so finally by increasing concentration of dose S. butanolic extract and S. ethyl acetate extract of Ficus racemosa Linn. showed significant relaxation of the contraction induced by the histamine and this relaxation increased with increasing concentration at the certain level of concentration of extracts. Histamine-induced broncho-constriction is the traditional immunological model of antigen-induced airway obstruction. Histamine, when inhaled, causes hypoxia and leads to a convulsion in the guinea pigs and causes very strong smooth muscle contraction, profound hypotension, and capillary dilation in the cardiovascular system. A prominent effect caused by histamine is severe bronchoconstriction in the guinea pigs that cause asphyxia and death 17. Bronchodilators can delay the occurrence of these symptoms. This extracts are only shown activity in the higher concentration of dose so there is a need to know the mode of action how the antiasthmatic activity occurred and there is a dire need to identify and isolate the phytoconstituents which responsible for the same. The result suggests that Ficus racemosa Linn. bark extract may have bronchodilator activity. The guinea pig lung strip was used for screening of antiasthmatic or spasmolytic action of extract, i.e. anti-histaminic activity and anti-cholinergic activities. This is because the presence of histamine H1 sensitive excitatory receptors and acetylcholine muscarinic receptors in the airway smooth muscle of man and animals have been established 18. The stimulation of H1 receptors produced graded dose-related contractions, and from the result, it was observed that the S. butanolic and S. ethyl acetate extracts of Ficus racemosa Linn. significantly inhibited the histamine-induced contractions on the guinea pig lung strip preparation Fig. 1-5 indicating its H1 receptor antagonistic activity and supports the bronchodilator properties of the plant. Phytochemical screening of Ficus racemosa Linn. revealed the presence of saponins, sterols/ triterpenes, glycosides, flavonoids, protein/amino acids, carbohydrates. Saponins are reported to possess mast cell stabilizing. Several flavonoids have been shown to possess smooth muscle relaxant and bronchodilator activity 19-26. The anti-asthmatic activity of Ficus racemosa Linn. may be due to the presence of the above constituents. CONCLUSION: From the result obtained, it can be deducted that at high concentration dose, of S. butanolic and S. ethyl acetate bark extracts of Ficus racemosa Linn. showed significant antiasthmatic activity as compared to other extracts of the same plant and may show a beneficial effect in asthma. ACKNOWLEDGEMENT: Authors are grateful to KLE’S COP, Hubli, Karnataka, India -580031, for providing necessary facility to carry out the study. Djukanovic LR, Roche WR and Wilson JW: Mucosal inflammation in asthma. Am J Respir Crit Care Med, 1990; 142: 434-457. Phillip F: Gene therapy for asthma. Mol Ther 2003; 7: 148-152. Prasad R, Lawnia RD and Gupta MR: Role of herbs in the management of asthma. Pharmacy Rev 2009; 3(6): 247-257. Govindan S, Viswanathan S, Vijayasekaran V and Alagappan R: A pilot study on the clinical efficacy of Solanum xanthocarpum and Solanum trilobatum in bronchial asthma. J Ethnopharmacol 1999; 66: 205-210. Theodorie C: The flora of presidency of Bombay, Published under the authority of the secratery of state for India in council 1908; 2: 441-446. Jakurian: Plant that heal, Pune, 1st ed., printed & Published by PH Lall at & for the owners oriental watchman, Published house, Maharastra 1995; 1: 158-162. Yoganarasimhan SN: Medicinal plants of India, Karnataka: interline publishing Pvt. Ltd. Bangalore and Dehradun, 2000; 01: 344-349. Annoy: The wealth of India (A dictionary of India raw material & industrial products, raw material, New Delhi: council of scientific & industrial research New Delhi, 1956; 4f-g: 34-37. Eomflen S and Krishanan R: Tropical Indian medicinal plants propagation method, Published FRLHT (Foundation for revitalization of local health tradition), Bangalore, Karnataka 2000; 1: 1013-1017. Longman orient; India medicinal plants (a compendium of 500 species), Longman Pvt. Ltd., Chennai 2002; 5: 224-228. Kirtikar KR and Basu BD: Indian medicinal plants, Dehradun: International book distribution, Uttaranchal, 1987; 4(2): 567-569. Yoganarasimhan SN: Medicinal plants of India. Tamil Nadu: Interline Publishing Pvt. Ltd. Bangalore and Dehradun, India, 2000; 2: 484-487. Khare CP: Encyclopedia of Indian medicinal plant, springer verlag berlin Heidelberg printed in Germany 2004; 3: 344-346. Anonymous, Indian Herbal Pharmacopoeia, Revised New ed., Indian Drug Manufacturers Association, Mumbai, 2002; 2g: 134-137. Turner RA: Screening method in Pharmacology, Academic press London 1965; 1: 129-133. Ghosh MN: Fundamental of experimental Pharmacology, 2nd, scientific Book agency Calcutta 1984; 2: 212-216. Goodman LS and Gilman A: Pharmaceutical Basis of Therapeutics, 10th, Macmillan Press, London 2001; 3: 234-238. Busse WW, Calhoun WJ and Sedgwick JD: Mechanisms of airway inflammation in asthma. American Revised Respiratory Disease 1993; 147: S20-S24. Hazekamp A, Verpoorte R and Panthong A; Isolation of bronchodilator flavanoids from the Thia medicinal plant Clerotendrum petasites. Journal of Ethnopharmacology, 2001; 78: 45-49. Bhatt K and Agrawal YK: Chemical investigation of the trunk-bark from racemosa. J Ind Chem Soc 1973; 50: 611. Chandra S, Lal J and Sabir M: Chemical examination of the fruits of racemosa Roxb. J Ind Chem Soc 1979; 5: 67-12, 1269. Merchant JR, Bakshi VM and Engineer AB: b-sitosterol, lupeol acetate and a compound, probably 13a, 14b, 17b(H), 20a (H)-lanosta-8, 22-diene-3b-ol have been isolated from the fruits of glomerata, Ind J Chem 1979; 17B: 87-88. Athnasios, Ibrahim El-sayed El-kholy, Soliman G; Isolation of psoralen, bergapten, y-taraxasterol, and b–sistosterol from carica. J Chem Soc 1962; 8(7): 4253-4254. Trivedi CP, Shinde S and Sharma RC; Preliminary phytochemical and pharmacological studies on racemosa (Gular), Ind J Med Res 1969; 57(6): 1070-1074. 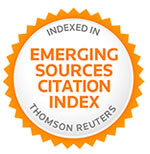 Li RW and Stephen PM; A cross-cultural study: the antiinflammatory activity of Australian and Chinese plant including racemosa, J. Ethnopharm 2003; 85(1): 25-32. Mandal CS and Maity KT: Anti-inflammatory evaluation of racemosa Linn. leaf extract. J Ethnopharm 2000; 72(1-2): 87-92. Saleem M and Byahatti VV: In-vitro evaluation of antiasthmatic activity of Ficus racemosa L. (Moraceae). 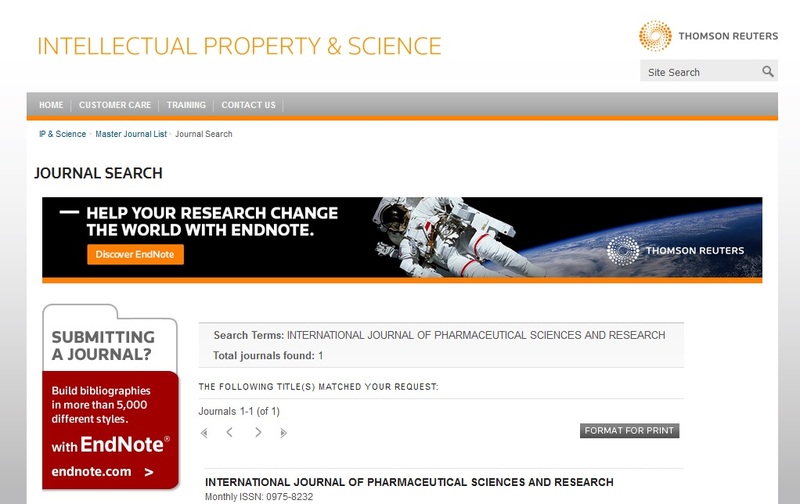 Int J Pharm Sci & Res 2019; 10(4): 2040-44. doi: 10.13040/IJPSR.0975-8232.10(4).2040-44.